NCIF’s research and Social Performance Metrics communicate the transformative impact mission-oriented financial institutions have in low-income communities. For mission-oriented banks, being able to the mission and social impacts of your organization to investors, board members, and other stakeholders is essential. NCIF equips such banks with our BankImpact Dashboard reports, a robust, independent financial, social, and environmental performance report customized to best detail how your bank is meeting the needs of your local communities. NCIF collects this information annually from partner banks on a range of datapoints capturing the impact of mission-oriented banks. Bank-reported data is used to create individualized Dashboards for each bank, as well as an aggregate report describing the combined impacts of the banks. 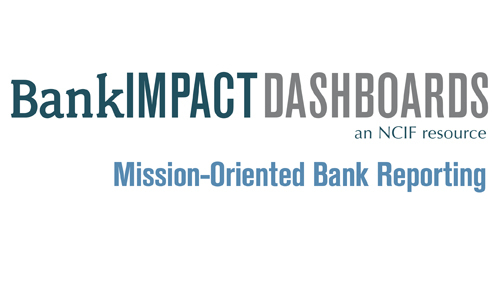 Bank’s individual BankImpact Dashboard contains NCIF’s analysis of that bank’s financial reports, Social Performance Metrics, quantitative & qualitative information, and public & self-reported data from that institution. Data collected for the NCIF BankImpact Dashboards can also be used by banks in support of other data needs in several ways. First, data points are aligned with the Global Impact Investing Network's IRIS 4.0 metrics. This allows for standard definitions and replication of datapoints across other data sources that require IRIS metrics. Second, questions within the NCIF reporting are mapped to CDFI Fund data requirements allowing for reporting banks to use data collected for NCIF to complete applications and reporting, and vice versa. Questions have been aligned for the Bank Enterprise Award (BEA), Financial Assistance (FA), and certification applications as well as CIIS reporting. These additions streamline the reporting process for banks and allows for greater accuracy in the data points provided.